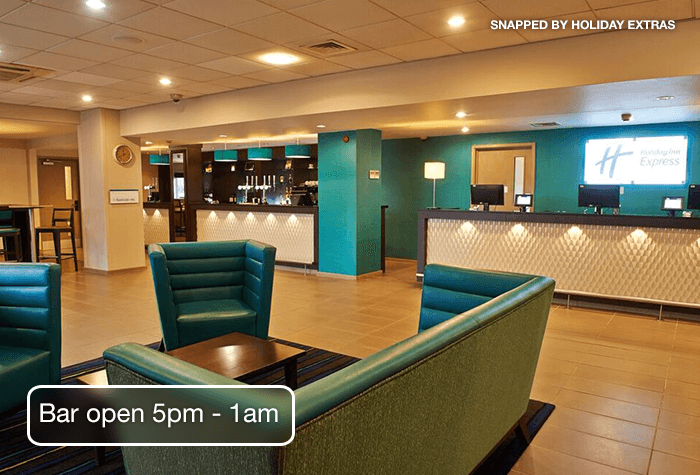 Holiday Inn Express at Manchester Airport, Manchester is a convenient 10 minutes away from the airport. Once you step inside however, you will forget you are so close to the airport and feel completely at ease, ready to start your holiday the way you should - completely relaxed. There are 199 modern and spacious Holiday Inn Express rooms, all of which have en-suite bathrooms and are extremely comfortable, with a choice of pillows, double or twin beds, free internet and tea and coffee making facilities. 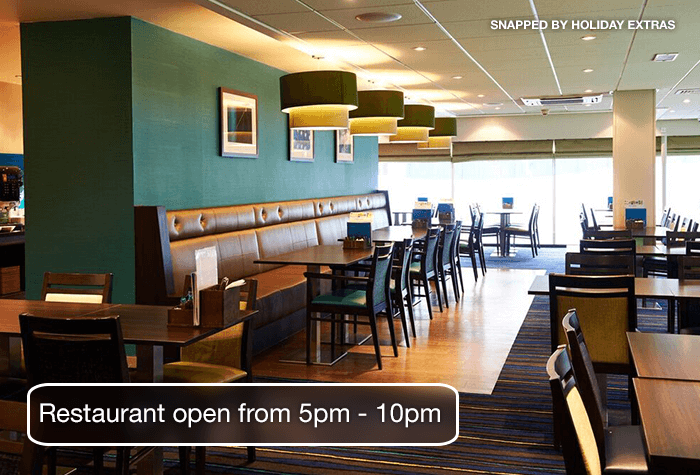 The Holiday Inn Express boast the welcoming Great Room Restaurant where you are free to start your holiday early with a delicious meal and well-earned drinks. The prices are fantastic - so there really is no excuse not to! The menu includes all of the traditional favourites you'd hope to find, and if this isn't enough to entice you, then maybe a free cooked breakfast will. 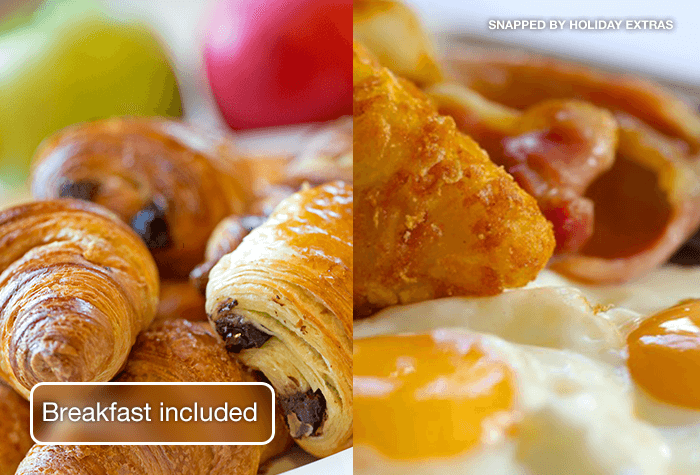 Served from 6.30am to 10am everyday, the hotel welcome you back to the Great Room to fill up on a continental breakfast and tempting hot items before you set off. 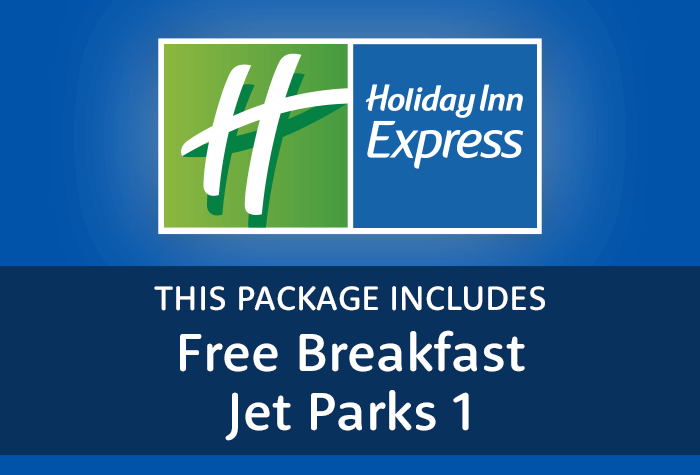 Not only have Holiday Extras done the leg work of finding you a Manchester airport hotel but we have also saved you time and stress by pairing the Holiday Inn Express at Manchester Airport with Jet Parks 1 car park. It is a great package to save you having to search for both an airport hotel and parking separately and when booked together you can save even more money. Hotel was great, quite room, clean, nice helpful staff. The jetparks however was not so great the included bus transfer was the issue as the drivers would not stop (multiple stops in the parking area and 1 at the exit/entry) people had been waiting for 40 plus mins with drivers driving past, I approached one driver who was very rude and said every was at the wrong stop and that they would not pick the people up.. really let down by this. The hotel was very convenient for the airport, the accommodation was basic but good, staff were friendly and helpful, but choice of food in the restaurant was very poor it was either spicy or fried with chips non of which we normally eat, I woke up with awful indigestion in the night. The hotel was o.k for what we wanted. The shuttle bus however never turned up to pick us up from the airport to the hotel. The driver of the shuttle bus taking us back to the airport dropped us off at the wrong terminal and when we told him we wanted to go to another terminal he told us he was going no further and we had to walk to our terminal. This was to be honest disgusting. Our customers rated Holiday Inn Express Manchester on average 9/10 (268 reviews). 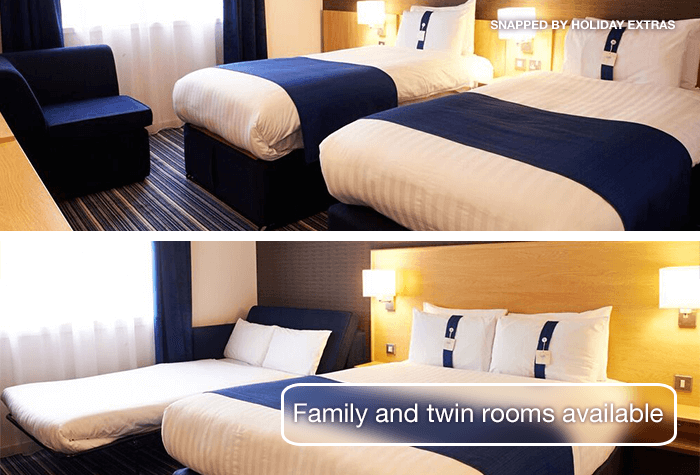 Families -The Holiday Inn Express appreciate that travelling as a family can be expensive, that's why with their large, spacious rooms, they allow families the comfort and convenience of an airport hotel at a price that won't break the bank. The price of the food in the Great Room Restaurant is fantastic too, so the whole family can enjoy the start of their holiday without the stress and worry of spending too much money. And of course, breakfast is free so you can make sure everybody has had a good feed before you set off for the airport. Convenience - As well as offering brilliantly low prices, the hotel's location, provides the convenience that you need. At only 10 minutes from Manchester Airport, you can wake up knowing you haven't got a long journey before your flight. You can park in the hotel's car park overnight for free and when your ready to leave in the morning, you can do so stress-free as your Jet Parks 1 parking, is already booked. You simply drive to the Jet Parks car park, park up and hop on the free transfer bus to the terminal doors. When you return your car will be exactly where you left it. This package includes parking at JetParks 1 car park. 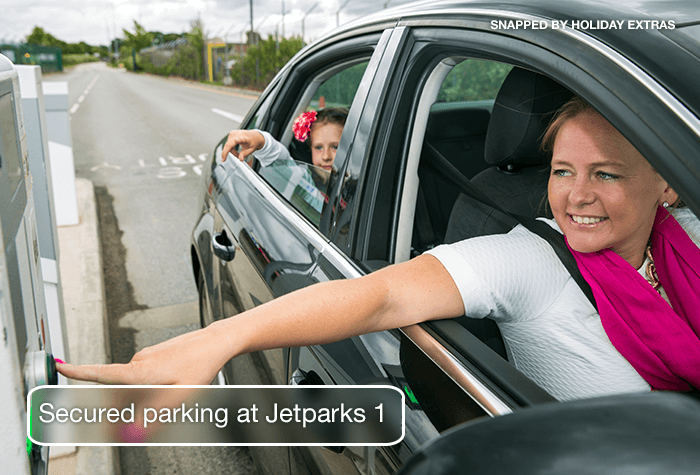 Youll need to drop your car at JetParks on the morning of your flight - its a 4-minute drive from the hotel. From the car park take the shuttle to your terminal. Its included in the price, takes between 5-12 minutes and runs every 15 minutes. Youll need to park overnight at the hotel before you take your car to JetParks 1 car park, which is £10 per car. JetParks 1 is a 5-12 minute shuttle to the terminal. Park in any space and keep hold of your keys. The car park has CCTV, floodlights, entry and exit barriers and is regularly patrolled. Directions and an address to the car park for your satnav will be on your confirmation email. The hotel is on the airport grounds and is less than 3 miles to all terminal buildings. Check in from 2pm. Check out by 11am. The rooms are spacious and clean. Considering its closeness to the airport, guests say its also very quiet. None of the en suite bathrooms have baths, but they all have walk-in showers. Family rooms have enough space for a cot, or a sofa bed. These can be requested once you've booked. 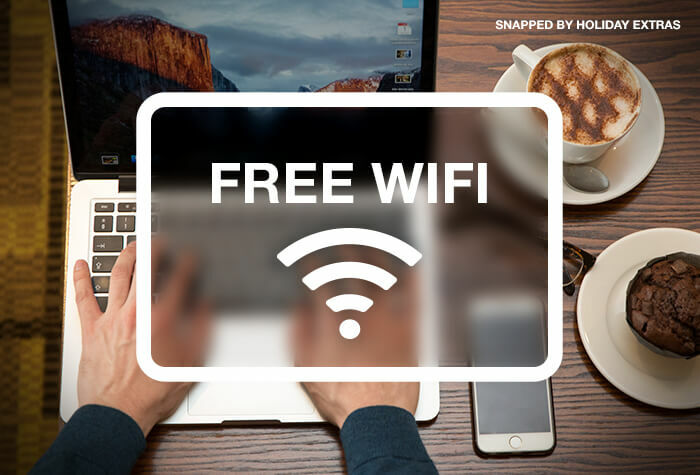 Wifi is free throughout the hotel and guests tell us it is a good speed - ideal for downloading films for your flight. If you would like to request an accessible room please call us before booking. The Great Room restaurant has a basic menu, which is reasonably priced. The average cost of a main meal is around £12, with the firm favourite amongst customers being fishnchips. International dishes are available, such as burgers, pasta and curry. 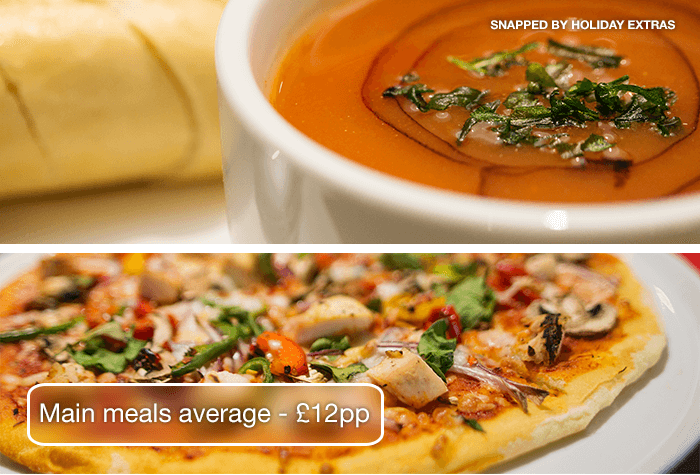 The menu also caters for vegetarian, vegan, dairy and gluten free diets. A separate kids menu is also provided. Open: 5pm - 10pm daily. The Bar Lounge has a limited selection of snacks to choose from. An average glass of wine starts from £3.50 and a pint of beer is around £2.90. Breakfast isnt a full English, but theres a selection of hot choices from sausages, beans and eggs, to cold options such as toast, cereal and pastries. It is served in the Great Room restaurant and is included in the price for all guests. We recommend requesting a room on the top floor when you check in, for a quieter nights stay. 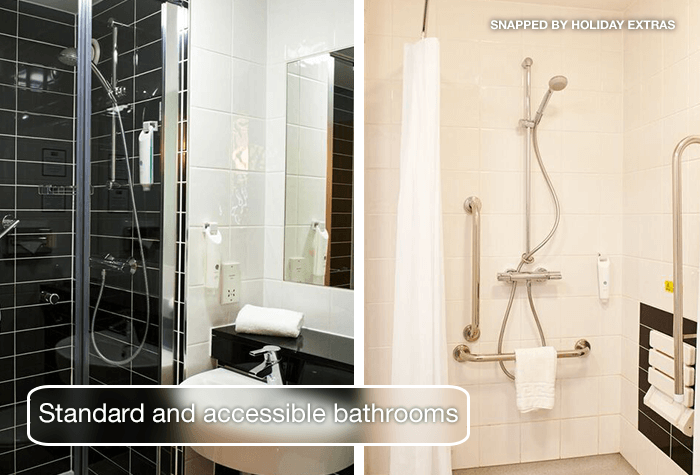 Disabled facilities The hotel has some rooms that are adapted for disabled guests that have roll-in showers. Call us on 0800 093 5478 and one of our team will contact the hotel to make the arrangements for you.